This week, Susan and Kitty decide the Top 10 Superhero Headquarters! Be it a mansion, a tower, or a secret lair, these notable HQs are home base for some of the greatest heroes in the DC and Marvel universes! Be sure to subscribe to the podcast on iTunes and Youtube, and leave a 5-star review if you enjoy the content! The home of Thor and countless other Asgardian heroes, the realm of Asgard is our honorable mention. As one of the Nine Realms of the cosmos, it houses Odin’s treasures and is the home of the Bifrost rainbow bridge. After it is destroyed, it becomes the two worlds Old Asgard and Asgardia, and the latter residing over Broxton, Oklahoma in the United States. There have been multiple Stark Towers, but this building is a mainstay of Marvel’s New York City skyline. It has hosted Iron Man’s bachelor pad as well as private work floors, research labs, and living quarters for various Avengers. In both the films and movies, Tony Stark has sold his tower in order to fund other ventures and bases for the team. The Watchtower is a stellar superhero headquarters, as it’s actually located in space! It has been located on or near the moon, or even as an orbiting space station. 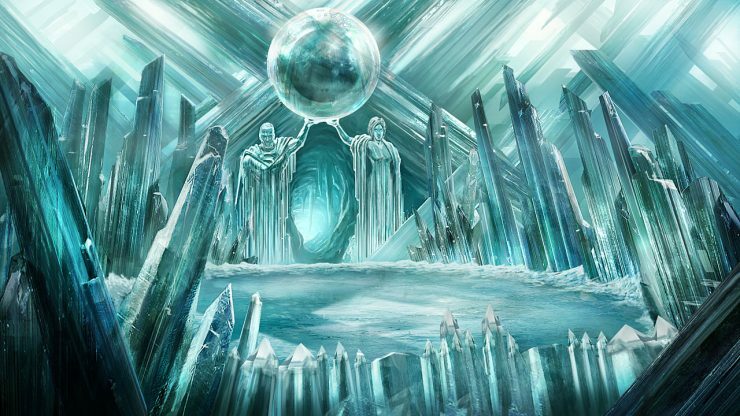 It is outfitted with the most highly advanced technology from Krypton, Mars, Thanagar, and Earth, and contains a number of rooms including an aquarium, an armory, and a promenade for ceremonies. Titans Tower is the T-shaped home base for the Teen Titans. The first version of the tower was build by Dr. Silas Stone, father of Cyborg Vic Stone. The current version of the tower is located in San Francisco, California, and houses a memorial for fallen members of the Titans- Kole, Terra, and Jericho among them. It is a living space and training quarters for the teenage hero team. The Sanctum Sanctorum of Greenwich Village in New York is the home of Dr. Strange, the Sorcerer Supreme. This mystical building holds many secrets and relics, and has been headquarters for the Defenders, and a refuge for the Avengers. It’s located at 177A Bleecker Street in NYC, but if you try to visit in the real world, you’ll be met with a bodega storefront. Mystic masters only. Avengers Mansion, formerly Stark Manor, was a facility donated to the Avengers by Tony Stark. It serves as both a museum and a headquarters, with three above-ground public floors, and three below-ground private floors. It houses quinjets and a gym for the heroes who live at the Mansion. This entry is specifically for the S.H.I.E.L.D. Triskelion of the Marvel Cinematic Universe- the headquarters for the massive organization that influenced every one of Marvel’s films in some fashion until its infiltration and destruction in Phase Two of the MCU. It was the base for members like Maria Hill, Phil Coulson, and Nick Fury, and was devastatingly overrun by HYDRA, and severely damaged by a helicarrier crash. The Fortress of Solitude is Superman’s famous Arctic refuge, located in a frozen tundra away from civilization. The key is extremely dense and can only be lifted by those with Kryptonian or similar physiques. Over the years, the Fortress has housed an alien zoo, Kryptonian artifacts, and robot servitors. The Batcave is where Bruce Wayne has the opportunity to truly be himself. This subterranean headquarters consists of a number of underground caves beneath Wayne Manor, hiding all types of technology, transport, and workshops for Batman’s crimefighting use. It is iconic as a superhero’s ultimate refuge, and the fantasy for fans to someday have a “Batcave” of their own. The Baxter Building is the 35-floor office headquarters of the First Family of Marvel, the Fantastic Four. It is the target of frequent supervillain attacks due to its prominence. Reed Richards is constantly updating the building’s technology and layout for maximum efficiency, fitted with living quarters for the family as well as labs and garages for their various modes of transport. The X-Mansion takes the #1 spot on our list, as the private estate of Professor Xavier that has become a beacon of hope for mutants everywhere. The X-Mansion is the place where heroes and outcasts alike can be their truest selves. Listen along with this episode and find out just why Susan and Kitty picked the X-Mansion as their ultimate Superhero Headquarters! Did you miss any of our previous episodes, including Top 10 Thanos Appearances and Top 10 Star Wars Background Aliens? You can check out the full Geek Culture Countdown podcast on iTunes. Keep an eye out for new episodes and more ways to listen coming soon.